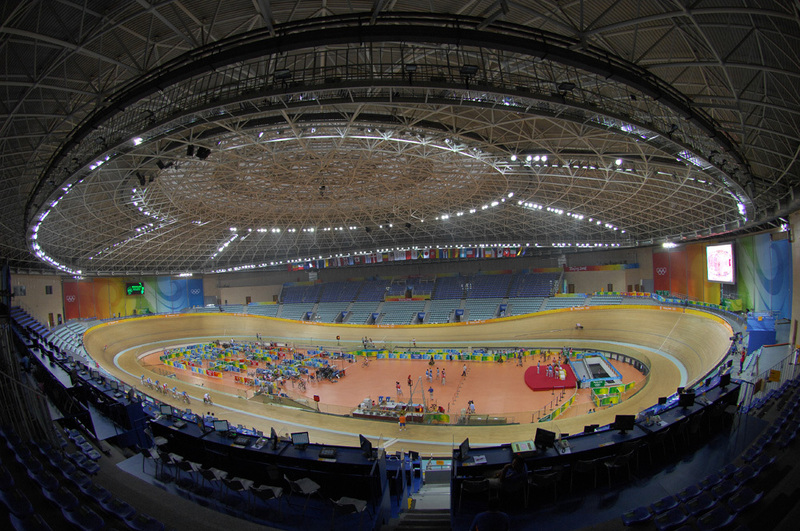 It may not have the impact of the immediately iconic Bird’s Nest stadium, or the stunning effect of the swimmers Ice Cube and it?s night time light display, but for fans of British cycling, the Laoshan velodrome is where it?s at. 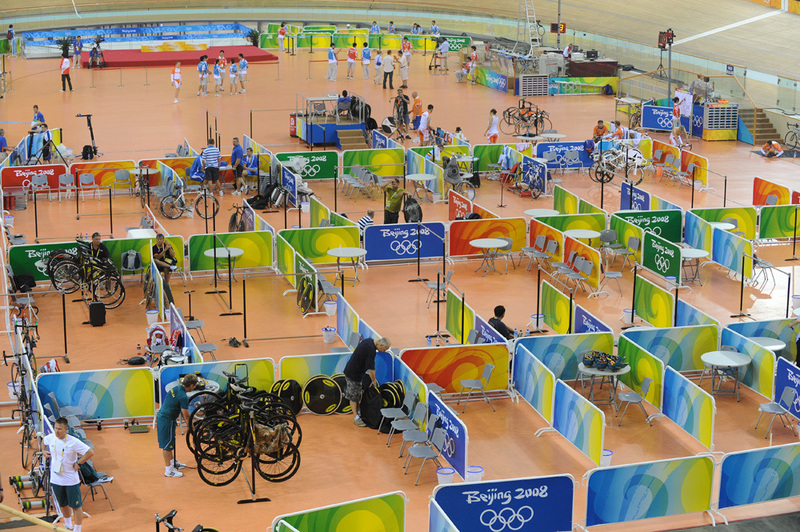 For this is where, over the next five days the British cyclists will bid to become the heroes of Team GB. It doesn?t matter that the velodrome doesn?t glow bright purple one minute and bright blue the next. It doesn?t even matter that it?s situated 23km south of the central Olympic village. What does matter is that this is where the bulk of British medals are going to be won, so for all followers of British sport, this arena is massive. Cycling Weekly took a bus ride out to Lao Shan to have a look around?.. The Laoshan velodrome is situated in the Shi Jing Shan district to the west of Beijing, with the BMX and mountain bike courses nearby. It is China’s first wooden surface track. The round building isn?t immediately impressive from the outside, it?s more striking inside. The track is on the first floor while office space, toilets and changing rooms etc. are all on the ground floor. It?s incredibly light inside the velodrome, in part thanks to the glass roof, but also in part to the huge lights that will be flooding the arena in light day and night when competition is on. Any amateur photographers out there may be interested to know that no flash photography is allowed (an Olympic rule applied to all events). The roof is made of steel and looks like a bit like a bicycle wheel, albeit a very heavy one. 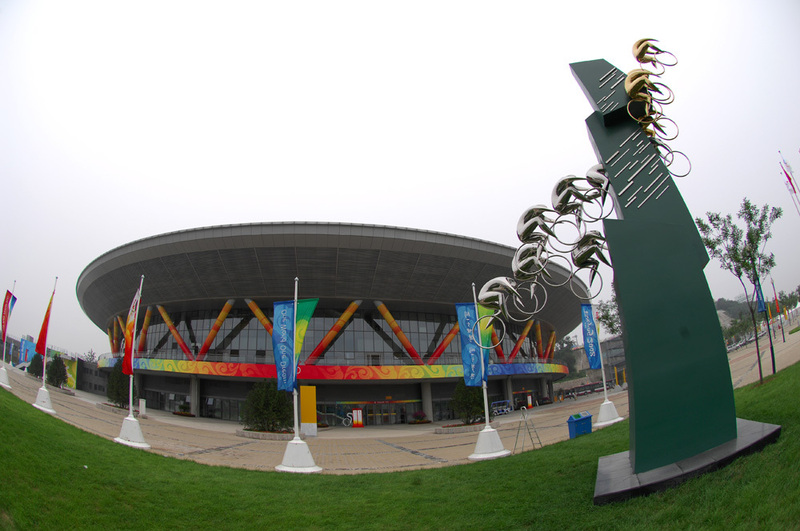 The 250m velodrome was purpose built for the Olympics and designed by Zhu Lv. The track is 7.5m wide with the straights pitched at 13 degrees and the banking at 47 degrees. The straights are a little longer than the Manchester track and the bends a little tighter. This is good for the sprinters who use the speed coming out of the bankings, but not so good for the pursuiters who aim to maintain a more average pace throughout their ride. The building will hold 6,000 spectators for the games, although many of these seats are temporary and will be taken out afterwards. The stadium could easily hold more but for the press gantries that dominate the area above the home straight. Like any track event the nations have their pit areas where they sit and wait for their event and warm up and warm down before and after. With 13 riders the British pit is one of the biggest. 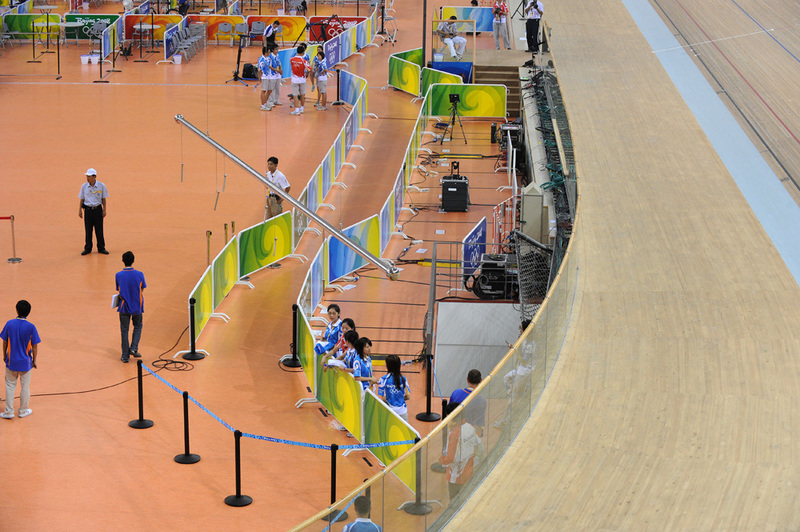 The central part of the track is where the riders roll around immediately before their event. Unlike the world championships, no press are allowed in this area. After their ride a competitor will be escorted to the ?mixed zone? where they are funneled down the corridor (shown here on the left) and interviewed by the press. This section here is where all the TV camera crews will be situated. All other press have to stand the other side of the podium (at the far end of the track) meaning a long walk for any riders who are especially in demand.